This Cobb salad recipe is loaded with great flavors and is a main course all to itself. The origin of "The Cobb Salad" dates back to 1937 when the owner of The Brown Derby restaurant, Bob Cobb (first cousin to baseball great Ty Cobb) was roaming his restaurant kitchen with Sid Grauman (owner of The Grauman Chinese Theater) looking for a late night snack. He randomly pulled things out of the fridge, such as avocado, lettuce, chicken, boiled eggs, blue cheese, bacon and chives, and started assembling a salad, topped with old fashioned French dressing. Cobb loved it, and Grauman was impressed. The next day, Grauman stopped by The Brown Derby for lunch, and asked for the salad Cobb had made the night before. It was a hit and was added to the menu. Last night I realized I had a lot of leftovers from the grill and all the ingredients to make a Cobb salad for the family. Everyone loved it. I decided not to make a video on this recipe. It would have been a video of me chopping things up. Kind of boring. 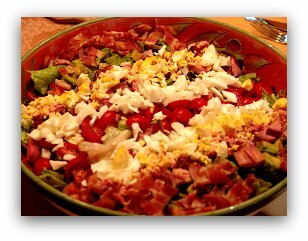 When making this Cobb salad recipe, I stuck to the traditional recipe, other than one addition. While over time many variations have surfaced, I have never seen a recipe that included beef, until now. I had some leftover skirt steak from the night before. I sliced it up thin and then cut them into bite size pieces. It was a fantastic addition to his delicious salad, and I would highly recommend it, especially if it has the outdoor smoky flavor. This salad easily served four people and there were leftovers. The assembly of the salad is simple. Lay the lettuce in a large salad bowl and artistically arrange the ingredients listed above, except for the blue cheese, which is added to the individual servings. The dressing for this salad has to be tart enough to cut through the rich flavors in this salad. The dressing is simple and works perfectly with this Cobb salad recipe. Then, slowly drizzle 1/4 cup of olive oil into the mixture while aggressively whisking, allowing the oil to emulsify into the dressing. Click Here to ask Dave a question about this recipe. He will get back to you within 24 hours. Just type your first name and email address in the form below. 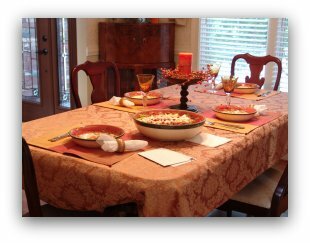 You will receive a monthly email from Dave covering techniques, recipes and content exclusive to "The BBQ Gazette. And don't worry, your email address is safe with Dave.